[Name], 7116 Via Correto Dr, Austin, TX 78749: the location for this address is readily available and any navigation system can take you to the doorstep in day or night; or in good or bad weather! This is an example of a structured address. [Name], College Tilla, PO Agartala College, Agartala 799004: Google Maps resolves this address to an area of roughly 76 sq. km. in the city of Agartala. This address is unstructured. Adding a landmark to the above address, “College Tilla near College Tilla Lake, ..” narrows the answer to an area of approximately 3 sq. km. Upon reaching the place, and depending on how much detailed information about the occupant or the house or the location is known (e.g. whose son/ brother the occupant is, what’s his age, color of his house and if is located by the old mango tree etc. ), one would take a additional 15-45 minutes, provided it’s not late night or raining. Moreover, landmark-based addressing is infrequent, incomplete and also inconsistent. These are not merely one-off experiences that cause inconvenience. The inability to provide an accurate location for each and every address, impacts the livelihood of residents in many ways. It inhibits growth of their local trades such as salons, bakeries or food stalls. It reduces availability of amenities such as creation of bank accounts and delivery of goods and services (e.g., e-commerce) and delays emergency services such as fire brigades and ambulances. The inability to locate an address within a reasonable accuracy, as demonstrated in the previous example, hampers a transporter’s ability to deliver shipments on time and without incurring additional costs. Consider the e-commerce industry, or any industry where goods are delivered to an address. In absence of proper geocodes, most companies in India, “sort” the packages or goods by pincode, since pincode is the only numeric location depictor that appears in most written addresses in India. We will pick an area within the Logistics and Transportation industry to illustrate the challenge in detail. Consider an e-commerce, which is growing at a 30 CAGR , driven by rising income, consumption and digitization , and it is expected to continue to do so for the foreseeable future. Indian consumers expect products to be delivered at their doorsteps for free, which causes a unique burden on the e-commerce companies not seen in most parts of the world. When a product from an e-commerce site is ordered online, the merchandize is picked up from a seller or a warehouse and brought to a processing, where it is sorted for the destination city- a process known as the “first mile operation”. It is then transported between origin and destination cities in a “line haul” that involves long-distance transportation such as truck, air etc. In the “last mile operation”, the merchandize goes to the delivery center from where it is delivered to the shopper’s house. Figure 3 illustrates this process. In western countries, structured addresses lead to a relatively accurate geocoding and consequently the last mile cost is about 10-12% of the total cost . In India, the same cost is ~30% of the total cost of delivery; notwithstanding India’s low cost of labor. The extra cost comes from the longer time that a driver takes in locating an address- to drive to an address, stopping multiple times to either call the recipient or ask someone on the road or nearby shops for location and directions, time wasted on additional kilometers driven in search of the address etc. Figure 4. Illustrates the challenges of delivering to addresses that cannot be disambiguated at the house level. In absence of a lat-long for the desired address, addresses are sorted based on pincodes and all the packages for one pincode are sorted, stored and delivered from one (or, sometimes, two or more) delivery center(s). Typical pincode-based sorting centers, located at the orange pin location can have a delivery “throw” (radius) of 4-20 km. In absence of understanding load distribution based on addresses, such centers’ locations often tend to be imbalanced. For example, in this case, while one delivery biker drives about 22 km, the other drives about 104 km, almost 5 times the distance covered by the first one. Such problems significantly hamper the initiatives to improve productivity and reduce costs at these centers. If the addresses, on the other hand, can be disambiguated down to a household level, then each individual locality can have a small delivery center, much like it is common to have pharmacy, grocery store or a restaurants in most areas. In such cases, the “throw” of the delivery center goes down to an average of 1-3 km. The bikers typically cover small distances in a shift and multiple shifts can be run in a day to match the schedule of multiple trucks that can bring loads throughout the day from the destination hubs. In Figure 4, the locations for such small delivery centers are represented by red pins and areas they cover are shown in yellow. This results in a significant improvement in productivity at the smaller centers that can do address-based sorting. Moreover, more granularity in the address geocodes, also allows us to perform route optimisation and provide system driven routes for the delivery boys. We provide the case of Delhivery, one of India’s leading logistics providers for e-commerce companies. At Delhivery, a switch from a pincode based to a locality based sorting has improved the productivity of the last mile operation by 40-60%, depending on the type/complexity of the addresses and size/shape of the locality. This high last-mile cost disproportionately affects a company’s bottom-line. 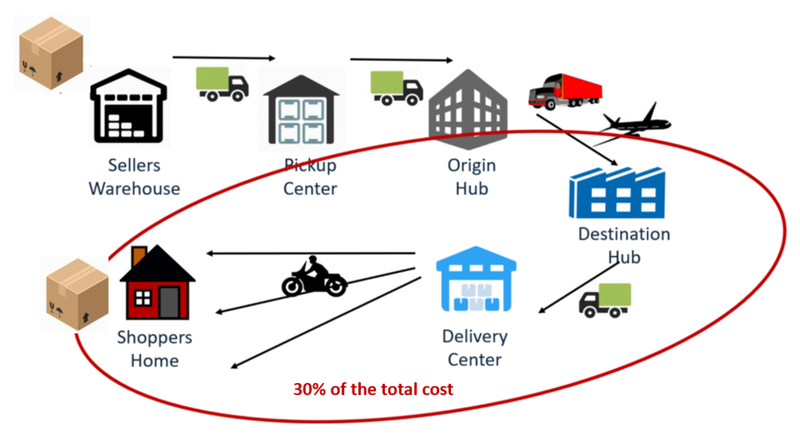 In a simplistic analysis in Table 2, we demonstrate that a better geocoding which reduces the last-mile cost by 40%, well within the reach of current technology, can improve the profitability of an e-commerce company. Even for a small industry in India, such as e-commerce delivery, which is estimated to be a 5,000 Crore (~$775M) business annually (as of 2017), the annual cost savings from a better addressing scheme is about 650 crore (~$100M). For the Logistics and transportation industry, the same framework can be used for different types of goods and services transportations. When a shipment is moved from one city to another, the line-haul segment, which is typically the inter-city transport, is not much impacted by the lack of proper geocoded addresses. However, both the first mile (pickup from a client or a distribution center, for example) or the last mile (delivery to a house or business) are impacted significantly by the inability to resolve an address, whether a bike, truck or a bicycle is used for performing that operation. India is a credit-deprived country where 642 million people, a staggering 53%, are excluded from formal financial products such as loans, insurance and other forms of credits and financial services. Even among those who are engaged in trades or small businesses, 48% cannot access formal credits or loans. The impact on the economy is significant. McKinsey estimates that the payoff for digital financial services in India by 2025 can be $700 billion and it can create an additional 21 million jobs . The reasons for the paucity of credit are many: lack of verifiable identity (akin to social security number in the USA), absence of proof of formal income in a largely cash-driven economy and complexity of disambiguating one’s location, be it home, or place of business. This has started to change in the past few years. Government’s initiative to provide biometric identity to all Indians (“Aadhaar”), has for the first time in history, given over 95% Indians a verifiable identity. Additionally, initiatives to open over 100 million bank accounts for the financially disadvantaged and push for digital transactions have pursued many startups to consider providing loan and credit services to the formerly unserved population. Consequently, in the past two years, funded by large venture capital investments in financial technology (“fintech”) companies, over 100 startups have started providing services for connecting borrowers and lenders. A courier picks these documents from the borrower. These documents are then scanned and saved in a database, from which it is compared against the information provided by the borrower on the loan application. Since the documents are typically paper-documents, an Optical Character Recognition (OCR) system is used for directly transcoding the information to a database. This process works well for about 60-70% of borrowers, especially in large cities. 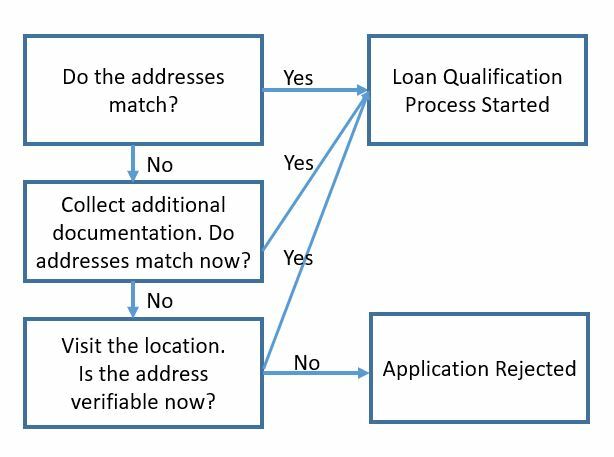 From our survey with leading firms, we estimate that about ~70% of the documents are considered a “match” and go to the next step for loan processing, e.g, loan eligibility analysis, approval of loans etc., albeit with only a certain percentage of applicants being eligible for loan. However for the ~30% of the applications, the address provided by the applicant in the application does not match the documents. To understand why, consider the following addresses for the same house, in Figure 6. The one in Aadhar card seems to have taken the path of safest approach, adding both the localities of “Mahadevpura” and “Garuda Charpalya” to the same address. In other words, just four different sources of official address verification documents can produce over 50 combinations. For the 30% of documents that do not match, the following process kicks in, as depicted in Figure 7. This results in delayed approval of the loans by up to 5 days in best cases and even weeks or months sometimes. This affects both the borrower, who could be in urgent need of money; and the lender, who has to bear the loss of interest he could have earned until the loan is finally processed and the cost of additional verifications. Also, the place of dwelling or the business being a key factor in the risk-assessment process of a loan, the inability to disambiguate it shows up in the risk models, raising the rate and hence, the overall cost of the loan. We conducted similar analysis for the top three industries- Logistics, Manufacturing (including consumer goods) and Emergency Services to derive a cost-estimate for India. Using this approach, our estimate indicate that poor addresses cost India $10-14B annually, ~0.5% of the GDP; see Table 4. Further note that the numbers presented in Table 4 capture the cost of bad addresses, but do not include additional benefits of having better addresses like rising productivity and income gains, which lead to further growth of businesses and GDP etc. Easily discoverable addresses are important for rapidly growing economies like India. Rather than just being a convenience, addresses are vital for driving a self-reinforcing economic cycles and therefore, improving livelihood and incomes for the next billion Indians. The consumers independently identify and adopt addresses for their own convenience while the businesses use technology or third-party services to resolve these addresses into geocodes to deliver products and services at reduced costs. However, the current addressing system in India does not lend itself to disambiguation to a reasonably accurate lat-long for most addresses. Our case-study analyses indicate that the lack of a good addressing system costs India at least $10-14B a year, or about 0.5% of its annual Gross Domestic Product. As the Indian economy continues to grow in both economic output as well as variety of new businesses and services, the costs due to lack of a proper addressing system will increase significantly. India therefore needs to consider a dramatically new approach to modernize the addressing system to bring in efficiency. Dr. Santanu Bhattacharya is scientist collaborating with Camera Culture Group at MIT Media Lab. A serial entrepreneur who has led Emerging Market Phones at Facebook, he is a former physicist from NASA Goddard Space Flight Center. Sai Sri Sathya is a researcher collaborating with REDX and Camera Culture Group at MIT Media Lab and formerly at the Connectivity Lab at Facebook, focused on Emerging World Innovations. Dr. Kabir Rustogi leads the Data Science team at Delhivery, India’s largest e-commerce logistics company. A published author, he was previously a Senior Lecturer of Operations Research at The University of Greenwich, UK. Dr. Ramesh Raskar is Associate Professor at MIT Media Lab and leads the Emerging Worlds Initiative at MIT which aims to use global digital platforms to solve major social problems.